Skilled thief, Royce Melborn and his good friend and mercenary, Hadrian Blackwater are back. After barely escaping from Essendon Castle, Royce and Hadrian have had enough excitement for a while. They were set up by the wizard, Esrahaddon. While walking, Royce and Hadrian come upon a girl being robbed by a man. They rescue her. The girl is from the village of Dahlgren. She asks for Royce and Hadrian’s help. She tells them she will pay them. Her village is being attacked by a demon, who is a minion of Uberlin. Royce and Hadrian travel to the village to help. Once again the wizard, Esrahaddon appears. Only this time he hints to Royce to check into Hadrian’s past. 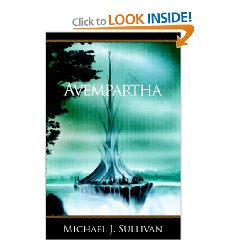 Avempartha is book two in this six part saga by author, Michael J. Sullivan. When I first read Mr. Sullivan’s debut novel, The Crown Conspiracy, I had no expectations. After finishing the book, I wanted more and couldn’t wait to read the next book. This series just keeps getting better and better. Royce and Hadrian at first appearances may not seem like heroes but watch out as they will amaze you with their skills, smarts, courage, and bravery. Avempartha is darker and edgier then the first novel. If you are up for the challenge to try out a new author and discover for yourself what many other readers are already raving about, then you have got to check out The Riyria Revelations saga. In Avempartha, the wizard hinted about Hadrian and his past. What could be so importa nt about Hadrian’s past. Hadrian’s past is revealed in this book. The land of Melengar is battling to save their kingdom. Princess Arista and her brother are at odds with each other. Both believe that they know what is needed to save their kingdom. Princess Arista hires Royce and Hadrian to head out across the lands of Melengar to meet with the rebellion leader. It will not be easy as there are others after them. Can the kingdom be saved and when Hadrian’s past is revealed, how will Royce react? The saga continues with Nyphron Rising. Just like the prior two novels, this saga grows stronger by leaps and bounds. I have become memorized under the spell of Mr. Sullivan. 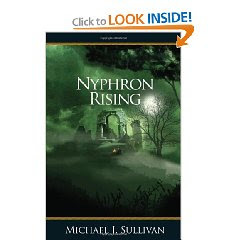 The Riyria Revelations dives into a magical fantasy world that readers will not want to leave. If I ever needed help, I would want Royce and Hadrian on my side. Though, I enjoyed this book, I have to admit that for some reason it took me longer to get into this book then it did the other two novels. It was not for lack of excitement as this book had been of action. There was no real particular reason why. Luckily, this did not deter me from anxiously awaiting the next novel.